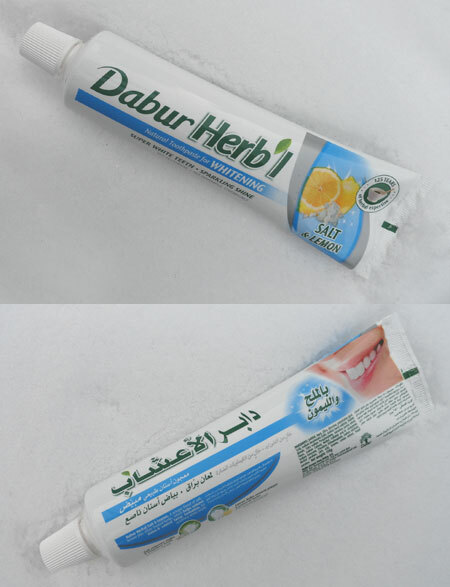 This lovely paste is from Dabur, an Indian company, by way of Dallas, Texas. I bought it at the India Bazaar in Irving, to be exact. The package contained a bonus toothbrush, which was awesome, since my travel brush had long since passed what should have been its last brushing. The paste has a very refreshing taste. The salt and lemon aspects are very subtle. I was expecting the flavor to be like drinking a margarita. But mint conquers any salt or lemon attributes. This could easily be a daily paste, if it were not for the "no flouride" aspect. I much prefer its subtlety to the in-your-face flavors of most American pastes. The back of the tube is primarily in Arabic, as the paste was made in the U.A.E. The claim in English that I could read was that lemon is supposed to remove plaque and prevent tartar. I am not sure about how true that is, but the paste left my teeth feeling very clean.